Is it not an irony of history that high-profile assassinations of most powerful people almost always remain shrouded in mystery for decades despite enormous resources at state’s disposal to unveil and identify the killers? The real handlers of assassin of JFK, and their motives, are yet to be known. Pakistan’s first prime minister, Liaquat Ali Khan, like PPP leader Benazir Bhutto, was killed in broad day light but the real assassins are yet to be identified and brought to books. The most powerful Pakistani president and military dictator, Gen Zia-ul-Haq, was killed in a mysterious air crash nearly a quarter of a century ago while he was in power but his assassins are yet to be identified. It is very clear that these assassinations were never made for personal reasons; there were powerful strategic motives behind these murders but the governments, who benefited in his life and also those who benefited in his death, are unable to point fingers. General Zia may be the most unpopular military dictator, if viewed from the prism of Pakistani democracy but historians can not deny the fact that he has left most indelible marks on Pakistan’s political, social and religious landscape. He fought Soviets, using Afghans, of course with American dollars and Wahhabi mercenaries and pushed the world into dreadful unipolar era. His gifts are drugs, Kalashnikovs, Wahhabi extremism and Afghan refugees, if we assess his achievements from the present-day standards. But those living in the world of 70s and 80s would shrug off this criticism saying he achieved a feat even the Americans could not dream of with their money and military might. 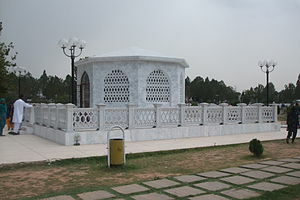 Leaving aside the deeds or misdeeds of Zia, it is very unfortunate that he was killed in a mysterious air-crash along with 31 other passengers including members of his top-brass, air crew and American diplomats, right in a garrison town which he was visiting under the arrangements of the army he was commanding at that time. It was a clear case of killing by powerful political players in connivance with Zia’s own comrades. The immediate spin given to this high-profile assassination was interesting. The New York Times, in its October 19, 1988 edition reported that the United States and Pakistan were destined to reach different conclusions about the cause of the crash. Although the technical investigation by a joint American-Pakistani team proceeded without much difficulty, it was complicated by the fact that Washington and Islamabad viewed the problem through starkly different political and cultural prisms. Pakistani officials pointed to Soviet-inspired sabotage as the likeliest explanation, citing intercepted conversations between Pakistani nationals and members of the Afghan secret service that suggested a plot against some senior Pakistani figures. The crash occurred against the backdrop of stepped-up Afghan and Soviet cross-border raids into Pakistani territory apparently in protest of Pakistan’s continuing support for the Afghan guerrillas. In a meeting in Moscow less than two weeks before the crash, the Soviet Foreign Minister, Eduard A. Shevardnadze, sternly warned Pakistan’s Foreign Minister, Sahabzada Yaqub Khan, that this support would ”not go unpunished. Struggling to establish stable relations with USSR, American officials expressed reluctance to embrace a Soviet conspiracy theory, and worried aloud that Pakistani military investigators might come up with unacceptable conclusions that the United States would be forced to denounce. The United States stressed the lack of evidence to support a sabotage theory and leaned toward mechanical failure. Only three foreign organizations active in Pakistan at the time against the Government fit that description: the K.G.B., the K.G.B.-created Afghan intelligence group, WAD, and the research and analysis wing of Indian intelligence (RAW). The State Department blamed WAD for many terrorist bombings in Pakistan’s cities in 1987 and 1988. In a few cases, Radio Kabul even announced the bombings before they occurred. Every WAD section reportedly has a K.G.B. adviser at the top. There are reports that as many as 1,500 Soviet personnel have been working at WAD’s Kabul headquarters. The analysis discounts India’s involvement in the air crash saying President Zia was certainly not India’s friend, but his actions as an adversary were relatively predictable. And there was no consensus among the experts about who would succeed him in the event of his death. Even Indian involvement would not get the K.G.B. off the hook. Indian and Soviet intelligence services were assumed by Western diplomats to be cooperating in Pakistan. Moreover, India’s strategic motives for such cooperation were well-founded: President Zia was bent not just on evicting the Soviets from Afghanistan but on establishing Afghanistan as his satellite. And in that lies the irony that his death best served U.S. interests. There was another theory implicating Mossad, the Israeli secret agency, and by implication the US. This was presented by John Gunther Dean, who was the American ambassador to India in 1988, according to an article in World Policy Journal by Barbara Crossette, who was the South Asia Bureau Chief of the New York Times from 1988 to 1991. When Mr. Dean expressed his views to the State Department at the time and insisted on a thorough investigation of the Israeli-Indian axis, he was accused of mental imbalance and relieved of his duties. Dean believes that the Israelis wanted to stop Pakistan’s military from making nuclear weapons. They had attacked Iraq’s nuclear facilities at Osirak in 1981 and believed Gen Zia when he declared in 1987 that Pakistan was a “screwdriver’s turn away from the bomb”. Dean was declared mentally unfit for demanding an investigation into the crash. He lost his medical clearance and security clearance because of his views and was forced to seek retirement in 1988. After he made the charge following the air crash in which the then US ambassador to Pakistan, Arnie Raphel was also killed, he was sent to Switzerland to “rest” for six weeks and only then allowed to return to New Delhi to pack his bags and quit. It is interesting that the US did not allow the FBI or any other agency to carry out a full-fledged investigation into the crash. The mortal remains were shifted to military hospital at Multan where doctors performed a post-mortem on Brig-Gen Wassom, which revealed that he had died before the plane hit the ground. Doctors were stopped from conducting post-mortems on the rest of the victims. If done, it could have determined their cause of death. The Board of Inquiry had confirmed the presence of sulphur, antimony and other lethal chemical agents in the wreckage. It is also suspected that odorless poisonous gases were leaked inside the cockpit, rendering the crew unconscious or paralyzed. This is why, it is deduced, no May Day signals were received at the control tower. US law requires mandatory FBI investigation into the killing of any US national in any part of the world. In this case, when an FBI team was about to leave for Pakistan, mysteriously, it was stopped by the US secretary of state. It was also surprising that the team that had already arrived to assist in the investigation had done so without any formal request by the government of Pakistan. Ten months after the crash, an FBI team arrived, comprising only three members and without any assistance from an air-accident or forensic expert. The team only recorded verbal statements of a few concerned individuals without any worthwhile effort to conduct a detailed investigation. When someone asked about the outcome of crash investigation, the then minister of state for defense who was supposed to have pushed for investigations, callously responded that anyone interested in the outcome of the investigations should make a direct telephone call to Allah, who alone can reveal the outcome of the investigations. Ijaz also makes a mention of al-Zulfikar, an anti-Zia terrorist outfit founded by Mir Murtaza Bhuuto. But the evidence available so far suggests that al-Zulfikar was not capable to carry out sabotage at this scale, though they are reported to have accepted the responsibility but backtracked immediately fearing American backlash as those killed also included two American diplomats. Ijaz also quotes from the outcome of some unnamed judicial investigations. A young officer of the Pakistan Air Force, Pilot Officer Akram Awan, arrested May 1988, was under investigation by the ISI for being an agent of RAW and Mossad. This officer was working in collaboration with enemy agencies to plan and execute an air strike on the Kahuta Nuclear Plant. He was arrested a few months before the C-130 crash and was in perfect incommunicado custody. He had not known anything about the Bahawalpur crash. Akram Awan stated that he had been handed over some matchbox-like device of chemical material by a Mossad operative in New Delhi to be delivered to Air Marshall Zulfiqar Ali Khan in Pakistan. The device once placed in the cockpit would render the crew incapacitated in less than 25 seconds. He deposed that meetings took place at the residence of the said retired air marshal and were attended by an Indian envoy, a US Army colonel and a Mossad agent who had travelled to Pakistan on an American passport. The above excerpts, carefully selected from Ijaz’s article say a lot about who might have killed Zia. If Zia, and his top-brass, was the target, then all others who died were a collateral loss for the killers. But their innocent blood will not go waste. The system of administration of Almighty’s justice is very ruthless and the killers and their handlers will have to pay very dearly. Kamra Attack: This is India’s proxy war in Pakistan…. Pingback: Who killed the most powerful military dictator of Pakistan?